What Is Weasley's Wizard Wheezes? Weasley's Wizard Wheezes is a joke shop founded by Fred and George Weasley, a pair of twins known for their pranks and sense of humor. The Weasley twins came up with many of their product ideas while they were still in Hogwarts, much to the consternation of their mother, who wanted them to pursue careers at the Ministry of Magic like their father. Harry Potter gave Fred and George the money they needed to start the joke shop. The theme park version of Weasley's Wizard Wheezes is designed to look like the Weasley's Wizard Wheezes shop seen in the Harry Potter films. 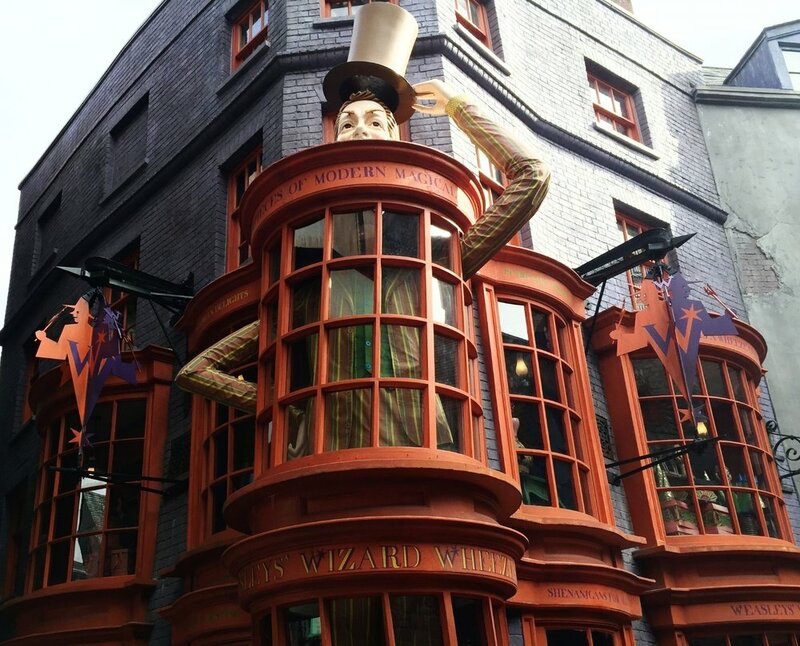 There is a 20-foot-tall robotic Weasley twin on the front of the building that lifts his hat to reveal a rabbit on the top of his head. He lowers the hat and then lifts it again to show that the rabbit has disappeared. The exterior of the building is painted a bold orange color that stands out among some of the duller colors in Diagon Alley. 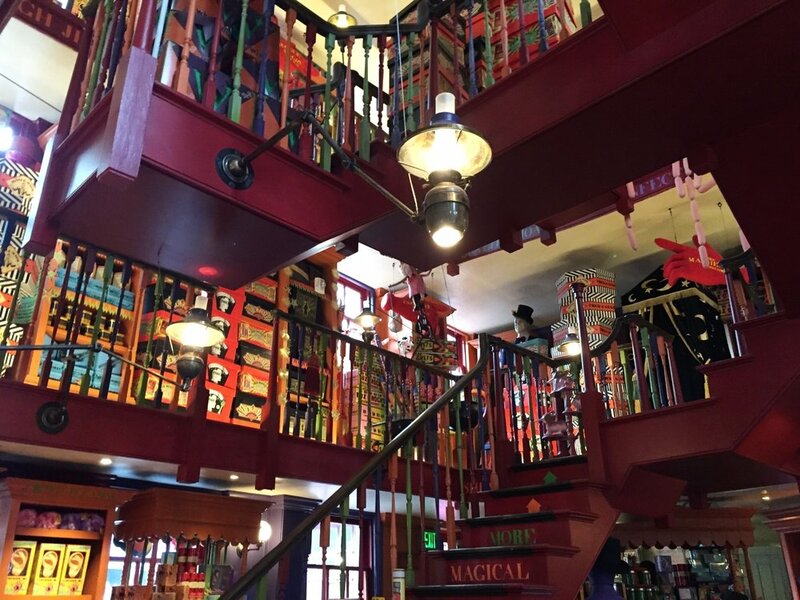 The interior of the shop is equally colorful thanks to the brightly covered packaging that covers all of the Weasley's products. Some of the items that you can buy in the store include clothing, Pygmy Puffs, Sneakoscopes, Decoy Detonators, Extendable Ears, and Skiving Snackboxes. 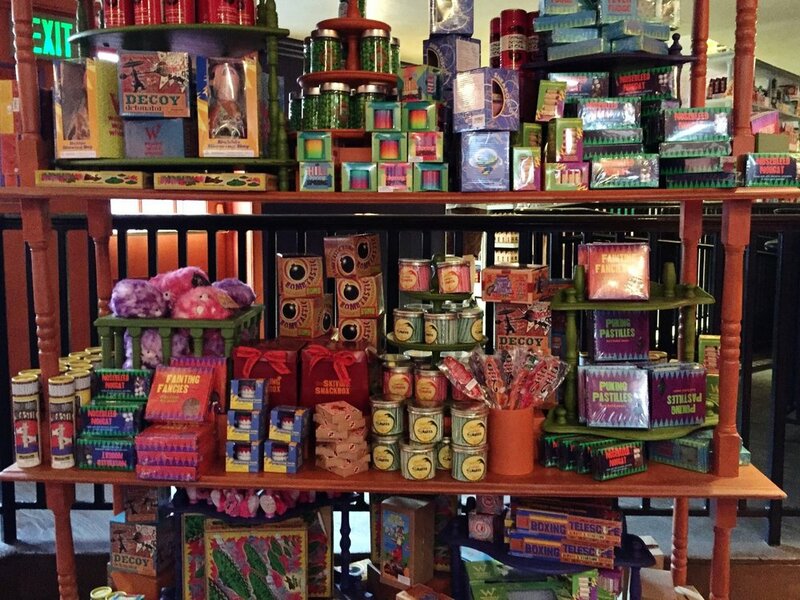 Merchandise display at Weasley's Wizard Wheezes. The upper levels of Weasley's Wizard Wheezes contain props seen in one of the Harry Potter movies. Weasley's Wizard Wheezes is located in The Wizarding World of Harry Potter - Diagon Alley in Universal Studios Florida. Fever Fudge, Nosebleed Nougat, Puking Pastilles, and Fainting Fancies are all part of the Skiving Snackbox line of treats created by Fred and George. 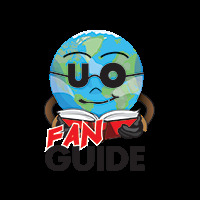 In the books/movies, each treat is designed to make the user sick so that they could skive off (skip) class at school. Some of the Skiving Snackbox sweets are color coded so that the user can eat one colored half of the treat to make themselves sick and then eat the other colored half to make themselves better. For example, each Puking Pastille has a green end and a purple end. One end makes you sick; the other end makes you well. The Skiving Snackbox treats sold in the theme park will not make you ill; they are just regular candies. If you buy the Skiving Snackbox, you can try all four treats: Fever Fudge, Nosebleed Nougat, Puking Pastilles, and Fainting Fancies. The treats come in a collectible cardboard box. The box looks just like the one that appeared in the Harry Potter and the Half-Blood Prince movie. The Fainting Fancies are the tastiest. They are a gummy snack that is coated in sugar. One side is orange flavored, and the other side is lemon flavored. You get four Fainting Fancies (4.4 ounces total) per box. The Puking Pastilles are hardboiled sweets (a.k.a. hard candy). It is difficult to separate the purple end from the green end. Each Pastille is rather large, so it is also difficult to fit the whole hard candy in your mouth at once - and if you try, it will probably get stuck in you teeth. You get four Puking Pastilles (4.5 ounces total) per box. The Fever Fudge is not high quality fudge. The cinnamon candies aren't bad, but the vanilla flavored fudge (tinted blue) is kind of waxy. You get two pieces of Fever Fudge (4 ounces total) per package. The Nosebleed Nougat is the only Skiving Snackbox treat with chocolate. You get three pieces of Nosebleed Nougat (4.5 ounces total) per box. The Skiving Snackbox candies are made in a facility containing peanuts, tree nuts, wheat, soy, milk, and egg - keep this in mind if you have any allergies. If you like the Harry Potter themed candy at Weasley's Wizard Wheezes, you should also check out the Harry Potter themed candy at Honeydukes and Sugarplum's Sweet Shop. Nosebleed Nougat from Weasley's Wizard Wheezes. Love Potion for sale at Weasley's Wizard Wheezes. Puking Pastilles from Weasley's Wizard Wheezes. Fever Fudge From from Weasley's Wizard Wheezes. 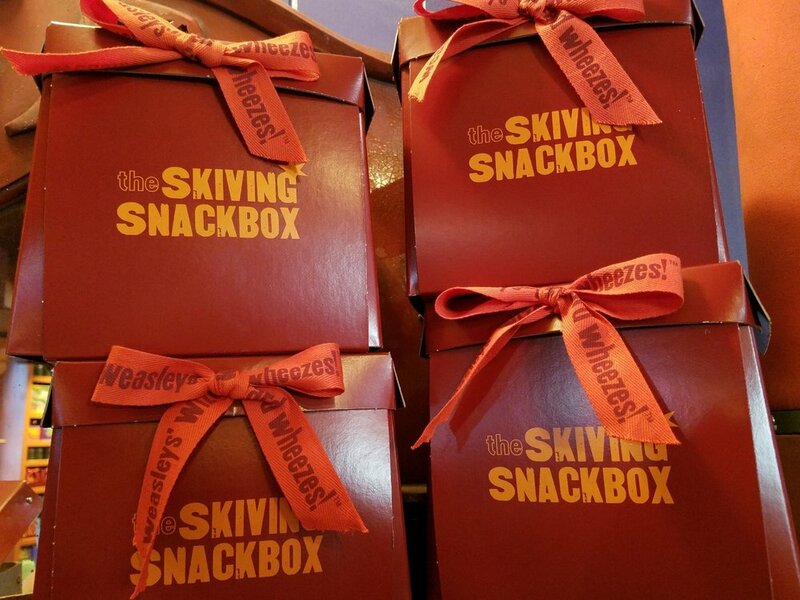 Skiving Snackboxes for sale at Weasley's Wizard Wheezes. Puffskeins are small, round, fuzzy scavengers that are common pets in the magical community. They like to hum, and according to Luna Lovegood, have been known to sing on Boxing Day. Puffskeins have long tongues, which they use to eat bogeys (boogers) out of their owners' noses. In his youth, Ron Weasley owned a Puffskein but claims Fred used it for Bludger practice. Fred and George Weasley bred Puffskeins to create miniature versions known as Pygmy Puffs. Ginny Weasley purchased a Pygmy Puff from Weasley's Wizard Wheezes in her fifth year at Hogwarts. She named him Arnold. You can purchase a pink or purple Pygmy Puff from Weasley's Wizard Wheezes for $18.95. When you squeeze the Pygmy Puffs, they make noise. 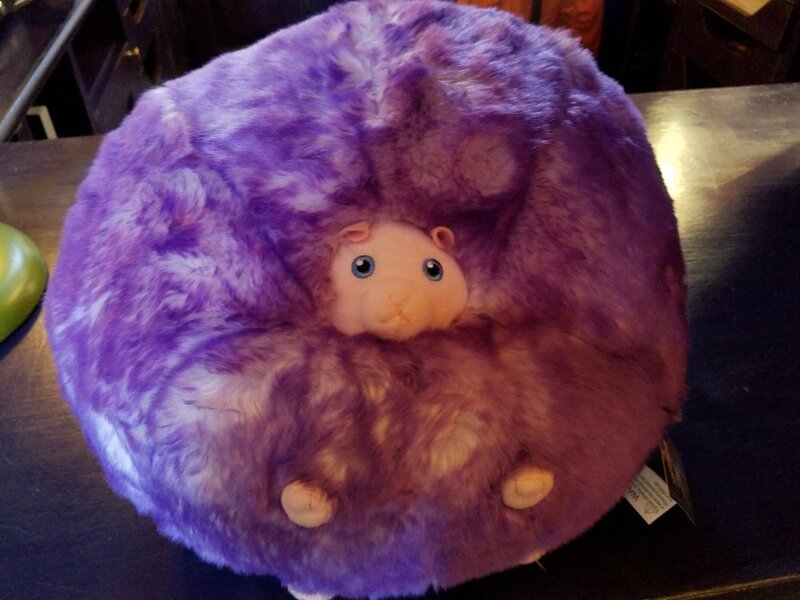 A large version of the Pygmy Puff is also available for $34.95. Pygmy Puffs for sale at Weasley's Wizard Wheezes. Large Pygmy Puff for sale at Weasley's Wizard Wheezes. Items like the Decoy Detonator and Extendable Ears cost about $20 each. A Fanged Flyer will cost you $24.95, and the MinaLima Replica Weasleys' Poster Collection costs $135. Some of the joke items and games are a little less pricey. For example, you can pick up a Boxing Telescope for $11.95 and a Slinky for $4.95. T-shirts usually cost between $25 and $30 each. 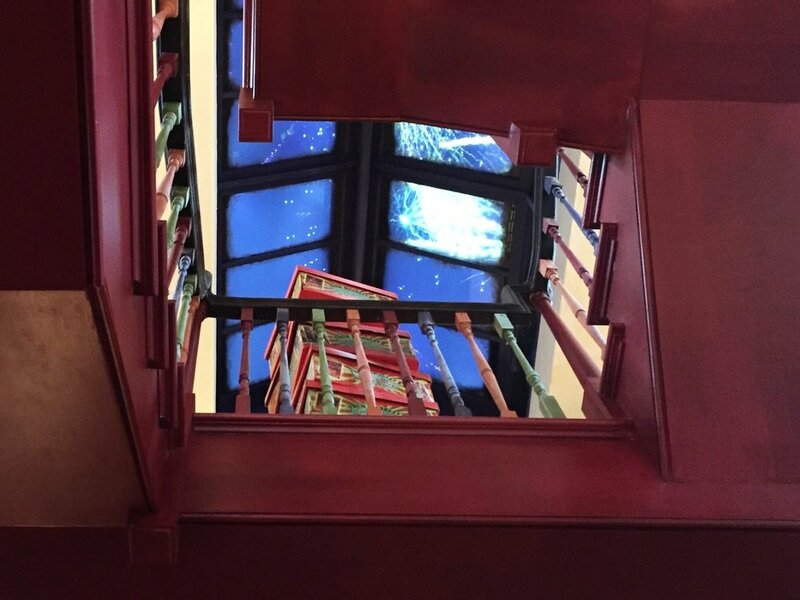 Before you leave Weasley's Wizard Wheezes, be sure to look for a few of the Easter Eggs inside and outside of the shop. If you are in the shop and look up, you can see fireworks exploding on the ceiling. Above the heads of shoppers, there is a tiny Dolores Umbridge riding a unicycle across a tightrope while balancing two cauldrons and saying things like "I will have order." This toy is also sold in the shop. Shoppers can only access the first floor, but if you look up at the second and third floors, you'll see many of the props that appeared in the Harry Potter and the Half-Blood Prince movie. Advertisements and slogans are painted on the exterior of the building. You can see ads for Edible Dark Marks, Skiving Snackboxes, and U-No-Poo. Some of the slogans include: "The Best in Jesting," "Always a Wheeze Guaranteed," "Petrifying Products," and "Shenanigans For All." The store windows contain many different gags and fun items. For example, one window features a schoolgirl (who evidently ate a Puking Pastille) throwing up into a barrel; another window features a group of Day of the Dead skeletons dancing near boxes of fireworks. Umbridge on unicycle in Weasley's Wizard Wheezes. Fireworks on the ceiling of Weasley's Wizard Wheezes. It took three months of solid work to build the three-story set for Weasley's Wizard Wheezes. The design team used 460 reams of A4 paper, 500 rolls of tissue paper, 250 meters of printing paper, 350 ink cartridges, and 73 different fonts to create 6,850 product labels and other props for the set. All the Weasley's Wizard Wheezes products and labels were printed and assembled at Leavesden Studio except for 400 Skiving Snackboxes, which were specially made in the Czech Republic. The cash register seen in Weasley's Wizard Wheezes was purchased from eBay and modified for the set.